Recent polls find a majority of Americans ‘believe’ that racism is getting worse, not better. The truth tells a different story. A good example of an ungrateful American hollering ‘RACISIM’ is Colin Kaepernick, a 49er National Football League quarterback, and is Exhibit A for why so many people believe the lie. A very poor Kaepernick signed a $114 million six-year contract in 2014, with $61 million guaranteed. It’s too bad that he has been singled out and so discriminated against. A standout athlete in basketball, baseball and football, Kaepernick chose to pursue football, making it all the way to the NFL as a quarterback for the San Francisco 49ers, one of the most storied franchises. Kaepernick, to show solidarity with the fabricated hypocritical Nazi George Soros Black Lives Matter movement, and to make a stand against so-called "oppression," he has chosen not to stand for the American National Anthem. He said that officers who "murder African Americans" have only been placed on administrative leave. The first problem with Kaepernick's "protest" is that the whole Black Lives Matter movement, launched after the death of black suspect Michael Brown of Ferguson, Missouri, is based on a lie. Contrary to the story told by his lying friend who was with Brown when he was killed by an officer, Brown did not have his hands up and did not say, "Don't shoot." Both the grand jury and Department of Justice investigation found that the officer who shot Brown acted lawfully and had reasonable fear for his life. Still, a "movement" was launched, bought and paid for by Billionaire Nazi war-crimes George Soros who bussed in professional demonstrators and protesters to Fergusson from other states. According to the Centers for Disease Control, police officer killings of blacks are down 75 percent over the last 47 years. Compared with blacks, twice as many whites are killed by cops. More blacks are killed by blacks than in all other ways combined. Men and women of all colors, ethnicities and races have died for the flag and the national anthem that Kaepernick refuses to honor. How many veterans -- some wounded -- watch or attend football games only to see their sacrifice disrespected by Kaepernick? How many soldiers who were football fans now lay dead and buried? Kaepernick defenders say that he has a First Amendment right to protest the national anthem. The First Amendment prohibits government from unduly restricting political speech. The NFL is a private organization. The NBA, for example, requires players to stand for the national anthem. The NFL does not, leaving it up to the players. Good thing Kaepernick chose football. So, as protests go, Kaepernick with hi contract risks very little. Sure, his popularity has taken a hit, with some fans having taken to burning his jersey. But he's guaranteed millions, no matter what. One might think that an athlete like Kaepernick, not long ago fined for calling an opposing player the N-word, would be a tad reluctant to blast America for its alleged racism and oppression. But of course this is about America's Racism, not his own. 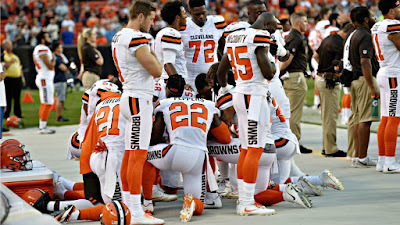 But this is not going away, it is a growing cancer, now the Cleveland Browns stage a team wide protest against our nation. 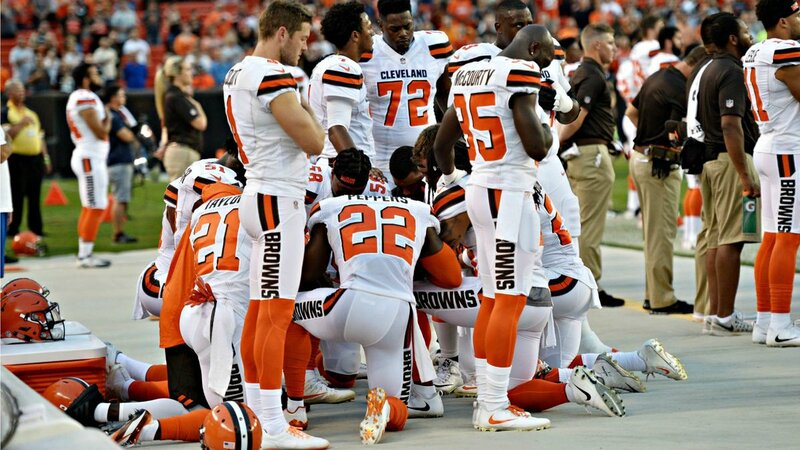 Not one, but eleven players from the Browns chose to take a knee during the playing of the National Anthem on Monday Night just before the Browns were due to kick off against the New York Giants. They “respect” the flag do they? Americans have the right to protest if they wish to do so, but these players, their teams, and the NFL need to realize that we can protest as well, we can choose to boycott the games. Seth Devalve, who participated in the protest, had the gall to admit that our nation is the “greatest in the world,” and yet he still chose to participate in this farce all because he like most programmed Americans are totally ignorant about the issue. The truth is that there is NO’ epidemic of police killing black men. But there is’ an epidemic of black men killing black men. If black lives matter so much, then why are they killing each other? So the question begging to be asked is do black lives really matter…to blacks??? I would urge Seth Devalve and every American and NFL Anthem protester to watch Larry Elder a black lawyer explain the true facts about “sytemic racism” in America before choosing to participate in another ill-considered, and foolish protest. Oh! And in case you are wondering just who this black American Larry Elder is’ that chooses to think for himself, instead of spewing out the lying robotic programming that the Communist media spoon feeds the ignorant America public, 24/7 then CLICK ON THIS. THE BOTTOM LINE: As the title says: “Racism In America Exists Only In The Minds Of The People Who Believe It.” Need I say more?